Harley-Davidson plans to publicly unveil its first electric motorcycle next week, a sleek, futuristic bike that hums like a jet airplane taking off. The Avengers are saving the world in more ways than one! As it turns out, super spy/master marksman Natasha “Black Widow” Romanoff is also an environment warrior, utilizing an electric motorcycle over old-school gas guzzlers for Joss Whedon’s Avengers: Age of Ultron. Superhero Hype reports Black Widow will saddle up in Harley Davidson’s first-ever electric motorcycle, called Project LiveWire, in Avengers: Age of Ultron. Rather than a Harley’s typical roar, Project LiveWire offers a quiet electric purr when it’s started. This sound will then build, but not to the expected growl of Harley Davidson’s long line of gas-powered motorcycles. You can hear the new sound of Harley (above) around the 0:19 mark. It’s downright sci-fi. I, for One, Welcome Our New Crop Devouring Overlords.. It sounds like a scene ripped from a hysterical sci-fi thriller — thousands of people fleeing their homes as an army of ravenous caterpillars take over town. But that’s exactly what’s happening in northern Liberia, in west Africa. Millions of caterpillars, believed to be related to the devastating crop pest the african armyworm are munching through fields and marching into homes, causing many people to abandon their houses until the flood of caterpillars recedes. There are also public health concerns as the sheer quantity of caterpillars means massive amounts of excrement is washing into rivers and other fresh water supplies. “We are afraid. You see here, the caterpillars are all over and there is nowhere to sleep. I am leaving with my children to a different community,” Mary Tolbert who lives in Gbarpolu County told AllAfrica.. Both Dr. Sizi Subah, deputy agriculture minister for technical services in Liberia and Winfred Hammond, a senior entomologist with the U.N. Food and Agriculture Organization, have said that the recent and unprecedented caterpillar outbreaks may be linked to disruptions in the rainy and dry seasons, fueled by climate change. The pseudo-scientific pretenders of climate denial take themselves very seriously, and they hate ridicule more than anything else. It speaks volumes about what internal polls are telling the White House, what I’ve been observing for the last 2 years. The pendulum has swung, and will continue to do so, on climate. The Earth is now speaking in a voice loud enough for all reasonable people to hear. The outliers, and the out-and-out liars, of climate denial, need to be confronted, refuted, and to the degree that they persist, treated like, well, like this. The sarcastic bear is loose, and he’s loving every minute of it. For the White House it’s about getting the liberal base excited for the midterms. It’s a confidence that climate change has shifted in voters’ minds. It’s a broader play against congressional Republicans as obstructionists. Above, Jim White of the University of Colorado puts climate change in real, on-the-ground perspective. Below, Washpost notes the creeping realization that, for life in low lying areas, the climate clock is ticking. Backstory: media still unable to distinguish actual authorities from self-described “experts”. NAGS HEAD, N.C. — The dangers of climate change were revealed to Willo Kelly in a government conference room in the summer of 2011. By the end of the century, state officials said, the ocean would be 39 inches higher and her home on the Outer Banks would be swamped. So Kelly, a lobbyist for Realtors and home builders on the Outer Banks, resolved to prove the forecast wrong. 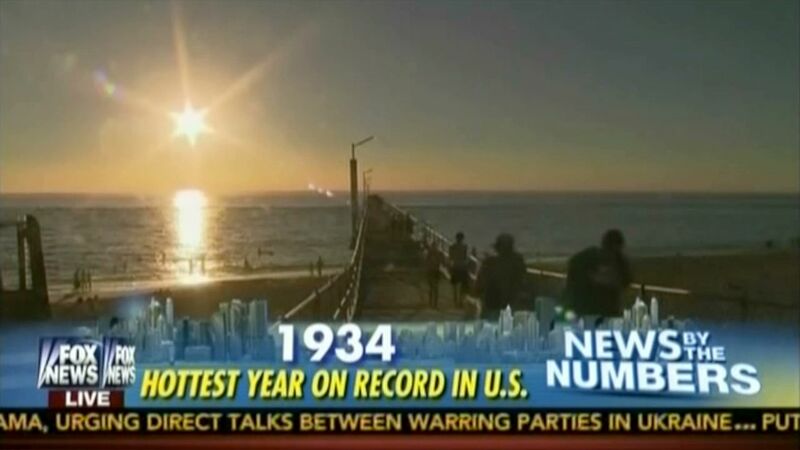 And thus began one of the nation’s most notorious battles over climate change. Coastal residents joined forces with climate skeptics to attack the science of global warming and persuade North Carolina’s Republican-controlled legislature to deep-six the 39-inch projection, which had been advanced under the outgoing Democratic governor. Now, the state is working on a new forecast that will look only 30 years out and therefore show the seas rising by no more than eight inches. Environmentalists are appalled, and North Carolina has been lampooned as a hotbed of greedy developers trying to “outlaw” the rising tide. Some climate-change experts are sympathetic, however, calling the rebellion an understandable reaction to sea-level forecasts that are rapidly becoming both widely available and alarmingly precise. Reassuring us that he’s a “conservationist”, Hank Paulson, who recently wrote a high profile piece in the New York Times warning business about climate change, says he supports the Keystone Pipeline. More of the Paulson media blitz below. Is this the position you take to portray yourself as “thoughtful”? Hank Paulson commenting on the release of the new “Risky Business” report on business and climate change. Despite the best efforts of the extremists, there are still some Republicans who believe in science. Many of these folks (regardless of their faith) do not think that the Bible was the literal word of God, and that humans were given a brain for a reason, namely, to think, to reason, to make judgments based on scientific evidence. The politics of global warming are not where my interest lay. (See “Profit From Global Warning or Get Left Behind.”) I am far more interested in your cognitive biases and how they manifest themselves in your investment portfolios. Fox News Flash! NASA Fakes Temp Data! Obama Born in Kenya! 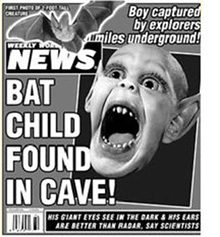 Batboy Found in Cave! How low are they going? This low. I profiled Anthony a few years back for his own craziness in regard to alleged plots to distort the temp records. Can we all agree that, if your denialist nuttery is such that even Anthony Watts can’t back you – you, my friend, are a denialist nut. Some segments of the Internet are abuzz with the claim by climate change skeptic Steven Goddard (Tony Heller) over at his Real Science blog that NASA/NOAA have been jiggering the numbers so that they can claim that warmest years in the continental United States occurred recently, not back in the 1930s. Folks, please watch out for confirmation bias. …while it is true that NOAA does a tremendous amount of adjustment to the surface temperature record, the word “fabrication” implies that numbers are being plucked out of thin air in a nefarious way when it isn’t exactly the case. About half the warming in the USA is due to adjustments. We’ received a lot of criticism for that paper, and we’ve spent two years reworking it and dealing with those criticisms. Our results are unchanged and will be published soon.